We can classify traits as qualitatively inherited and quantitatively inherited. With qualitative traits, characteristics can be placed into a small number of distinct categories. Natural environment does not affect these traits. A small number of genes affect these traits. 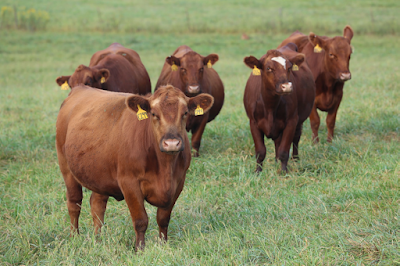 Examples include coat color or horned vs. polled. Quantitative traits are measured on a continuous scale, influenced by the environment, and a large number of genes influence these traits. Examples include growth. Additive genetics refers to the effect of inheriting a beneficial allele increasing performance in an additive manner [additive inheritance can also be easily predicted]. For example consider the A gene. If a calf has two copies of the A2 variant (genotype is A2A2) it has a breeding value (twice the EPD) of 0. If we add an A1 variant (the genotype is A1A2), this calf has a breeding value of 10. If we add a second A1 variant (the genotype is A1A1), this calf has a breeding value of 20. We can do this for multiple genes. 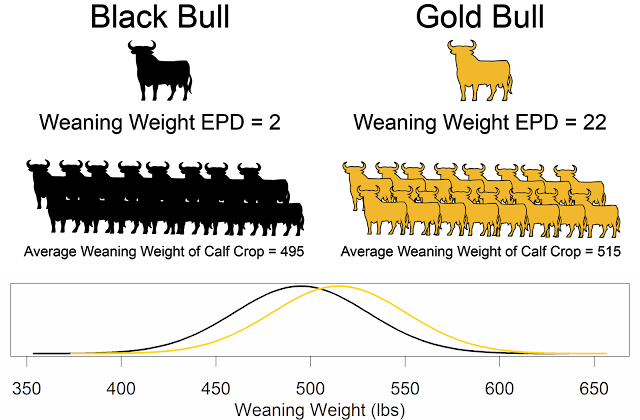 The additive effects of genes determines the breeding value. But, the actual performance of the animal can be different from the breeding value due to the effects of the gene which are not additive (non-additive, dominance, epistasis, etc.). These non-additive effects can lead to hybrid vigor (the progeny outperform the average of the parents). When a large portion of the trait is due to additive genetics (narrow-sense heritability is high) then there is little hybrid vigor. When a small portion of the trait is due to additive genetics (narrow-sense heritability is low) then there is much hybrid vigor. The increase in gestation length and increase birth weight in Brahman and humpless cattle (British or Continental) appears to be due to the effects of the embryo, not the uterine environment. The hybrid vigor (heterosis) effects do not behave according to predictions based on the generation of the cross (crossing two F1s to make an F2 is the second generation of crossing). For some traits we don't see a decrease in performance that we would expect between an F1 and an F2. There is a lot about genetics that we still don't understand the details.